1. Preheat the oven at 350°F. 2. 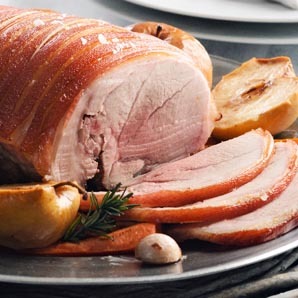 Cover the ham with water in a cooker and let boil for 45 minutes. 3. Take the ham out of the water and insert the cloves into the meat. 4. Put the ham in a baking dish. 5. Mix all the ingredients for the sauce and baste the ham 3 times during the 2 hours of cooking.